This is an interesting area to visit. It took me two days to hike the complete area. Most of what are called "trails" are actually roads leading through the area. It is a mostly a scrub area, with some forest where the Econlockhatchee River can be found. The complete area is surrounded by civilization, which is creeping up to the very edges of the preserve. There are few areas you can be in that you do not see some thing that is not manmade. From powerlines running through the middle, to the view of a coal burning power plant through the trees, to views of houses from many spots. That being said, it still is a very nice area to visit. Being that you are exposed to the open sky a good deal of the time, I recommend that you try the long hikes in the winter time. You have the option to hike, bike or ride your horse in it. 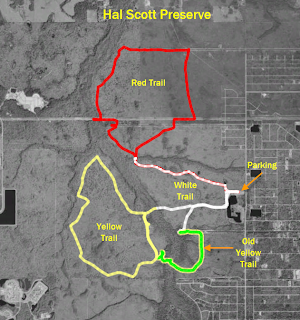 Hal Scott Preserve borders RT528, you may have noticed Dallas Boulevard as you drove to/from Orlando. You can not get on Dallas Boulevard when going West on RT528, but there is an exit going East. I recommend getting to Dallas Boulevard by taking Maxim Parkway off RT520 and working your way back to the preserve. There are number of primitive campsites located in the preserve, these are located in the southern section of the preserve. The entrance is off Dallas Blvd in Wedgefield. From the entrance walk in about .3 miles to decide which way you want to go on the white trail. Red Trail Loop - listed as 6.1 miles. As mentioned before, you must take the white trail to get to this trail, which adds distance to the trip. Like the other trails, this is mainly just a road and is open most all the way. You cross under some pretty impressive powerlines at different times. At different spots you can explore the cypress areas if you so desire. The entrance to this trail is at N28 29.658 W81 07.436. There is a small stream you may have to ford at the beginning of the trail - the day I was there it was pretty dried up. There are a couple of bridges over the Econlockhatchee River, with one being the main way to the yellow trail loop. There are a number of other ways to cross the river if you wish to do some exploring. While out exploring, I did find the old yellow trail and hiked that to give it a look. I have no idea why the powers to be decided to do away with that section of the trail, but they did. As I've said, I've hiked all the trails, as well as doing some exploring into some of the areas off the marked trails. So, the bottom line is that this is a nice place to get out and see a variety of Florida ecosystems. It can be a long hike, but I did enjoy my time in the area. I saw some wildlife and some flowers. I took a mess of pictures while hiking around. I think it is a very nice place to hike, bike and explore. Just make sure you bring plenty of water, as it can get pretty dry out there! Thanks for all of your great posts Tom. Just a small FYI on this one-the residental area off Dallas is Wedgefield- not Wedgewood. We have property there, and hike in this area often. It's a small change, but it might help some people if they are looking for it! Thank you very much Ellen for this information - always appreciate things which can make it better for everyone! The change has been made. Hi Tom! My husband and I just moved to the East Orlando area, and were checking out Google Earth, when we stumbled across your pictures from the Red, White and Yellow Trails. Thanks for all the helpful info, and great pictures! Take care, stay safe, and God Bless!